Based on an ongoing budget impasse and the flat spending plan released by the White House this week, the troubled James Webb Space Telescope likely won't begin probing the universe until at least 2016, according to the mission's top manager. Congress has only approved temporary government funding measures since the current fiscal year began Oct. 1, curtailing NASA's ability to boost spending on JWST despite needing more money to keep the over-budget mission on track. An independent review panel, chaired by NASA project manager John Casani, concluded last fall the earliest JWST could launch is September 2015 at a total mission cost of $6.5 billion. NASA was previously holding to a June 2014 launch target at a life-cycle cost of $5.1 billion. The September 2015 launch date published in the Casani report was just the best-case scenario. 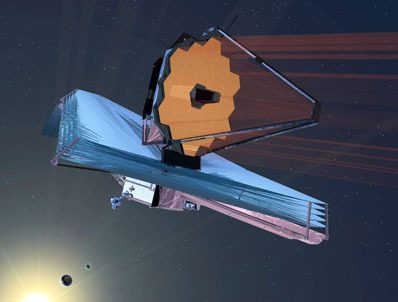 It required the JWST program receive $250 million in extra funding in both fiscal years 2011 and 2012 to get the observatory in space by late 2015. "The independent review said we would need more money, and we are looking at that," said Elizabeth Robinson, NASA's chief financial officer. NASA officials in November were pessimistic about securing more money for JWST, and now the agency's senior program manager says the mission's scheduled launch in 2015 is "out of the question" if current spending trends continue. Richard Howard, JWST's program manager at NASA Headquarters, said a launch in "'15 is certainly out of the question as we march down time. Maybe '16 is possible, maybe it's not. We'll have to look at that." Howard said his statement was based on the lack of progress in the 2011 budget and the reduced spending on JWST in the White House budget request. The government is operating under a continuing resolution, a stopgap budget that keeps this year's spending near last year's levels. Such an arrangement usually precludes significant increases in funding like those needed by JWST. Republican leaders in the House of Representatives are proposing extending the current continuing resolution through the end of this fiscal year Sept. 30. The current spending plan expires March 4. Such a move would keep JWST from receiving more money this year, and NASA is unlikely to find such a large sum from within its own accounts. The Obama administration's budget request covers the next fiscal year beginning in October. It calls for $375 million for the JWST program next year, a $64 million cut from the budget it received in fiscal year 2010. The White House also proposes budgeting $375 million each year on JWST through 2016, keeping the telescope's funding flat. JWST, the successor to the Hubble Space Telescope, was touted in the Obama administration's major government terminations, reductions and savings document posted on the White House website. NASA says the $375 million budget line for JWST protects other agency science missions and stabilizes the program. Howard's position was created following the Casani report's public release in November. His management team is leading a thorough review of the JWST program to develop a realistic cost estimate and launch date. The new baseline would be shared among top agency officials and the administration before being incorporated in the fiscal year 2013 budget process. NASA will identify how much extra funding is needed then to accelerate the launch date, then the government will decide if it is worth it, Howard said. Robinson said NASA could release the new JWST baseline cost and schedule this summer. JWST is a joint project between NASA and the European Space Agency. With a 21.3-foot-diameter primary mirror, the telescope is designed to peer back in time almost to the Big Bang, giving astronomers a glimpse of infant galaxies as the universe cooled.